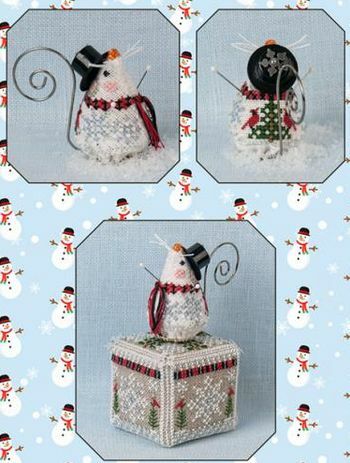 A limited edition ornament, Frosty Chillingsworth Mouse is stitched on 32ct white Belfast linen. Stitch count is 57w x 29h, design size is 3.5" x 2. Kit includes hanger for tail, antique brass button for base, beads, black top hat, white tipped pins for arms, and snowflake sequin. You supply the linen and floss. This is an accessory for the Frosty Snow Cube, which is sold separately.